Used to provide grain, minerals, salt or water to animals. Need a larger trough? See PortaTrough™ 5. Please contact us for a shipping quote to AK, HI, Canada or Mexico. Used to provide feed to a ram or two on pasture or to feed a small pen of show lambs or goat kids. 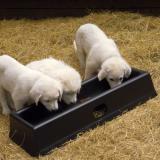 Feed livestock protection dogs and puppies without worrying about the feeder being tipped over by a playful puppy (or ewe). Difficult for animals to tip over. 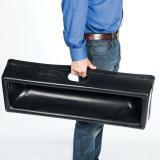 Stackable for easy movement and storage. Side handle allows it to be inverted with a toe to tip out water or ice. High sides prevent feed from being knocked out and wasted. Won't break if water freezes in it. Rounded inner base is slick so sheep and goats dislike stepping in them. Depth of water allows waterfowl to bathe their heads to their eyes and nostrils. A collection of articles from livestock nutritionist, Woody Lane. In depth, informative and very helpful knowledge for livestock producers. The fit in the back of an ATV so they are very portable. Lighter than a wood trough and they won’t rot. The times we’ve managed to break one of these was after driving over it with our tractor (not advised). 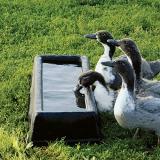 We’ve used these to provide feed/water for ducks, geese, puppies, sheep, goats and chickens. I purchased 4 of the Porta Trough 3's, I have deer, Canada geese, multiple species of ducks, ravens and other critters on my property. 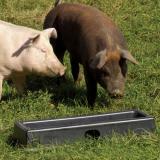 I wanted a safe clean way to feed and water and these troughs are wonderful. They are lite to move, yet very strong. They also clean up very easily. Thank you for a great product. We have a large and 2 small troughs. They are easy to move, clean, and suit our sheep perfectly for water and feed. My ram lambs still try to stand in it. The short one is long enough for my 4 ram lambs to feed at once. 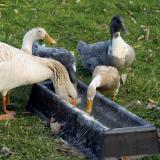 I use this feeder for my 3 chickens and two ducks, and it works well enough, although it does have some faults. Some things I DO like about it is it's deeper than I thought, It would work well for water but I use it as a kind of trough. It's also very heavy, I can imagine it might be hard for small hogs and sheep to knock around. What I DON'T like about it is it's VERY overpriced, after all it's only a piece of warped plastic, you guys need to lower the price to maybe 29.00 bucks, not 40. That was my two cents. Love these troughs. Had been using dog pans to feed. What a lot of work that was. Now I just empty the bag of feed into the troughs and walk away. No need to pick up pans. What an easy way to feed. 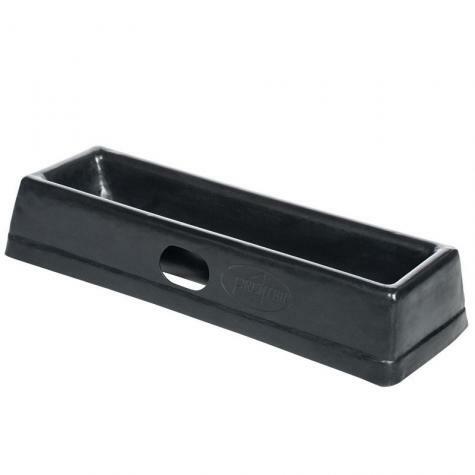 The troughs are sturdy and they have a nice foot hole so you can dump out any rain water without even bending over to do it.